Covered In Crafts: Aurora is a Witch! So... this is the first year that my little girl has asked to be anything that wasn't a fairy or a princess (or a fairy princess) lol! She wanted to be a witch. She saw a tutu on Etsy that she really liked and we knewn we could make. So we set out to make her Halloween costume. Grand total for everything she wanted: $7. Can you believe that?? She is wearing black pants and a black shirt she had already. The tulle is from Joann's (with a coupon). 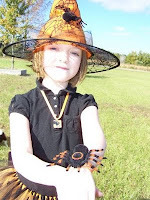 I hot glued a spider to an orange ribbon bracelet and tack stitched another spider to her hat. Forgive me for my pictures. You all know by now that I'm no photographer. How cool is that view of my front yard though? Across the street is a beautiful old red barn and the trees are starting to look so beautiful. I'm so lucky!! I hope you all have a fun and safe Halloween!!! 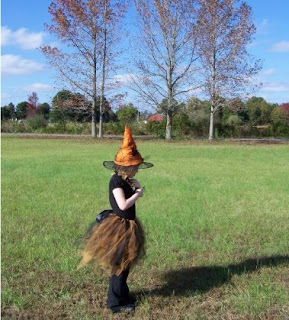 Awe and what a cute little witch she is too!